Hello Mike, from The Fitzgerald Theater in beautiful downtown Saint Paul, Minnesota! I'm making some this evening! Marietta? I've been in your corner, Chak Man. We have people outside Atlanta. About how many hours a week does the regular cast spend in rehearsals? Hello Shane! Thanks for staying up to join us! Coming in clear as a bell, good picture too!! Cool beans! Next time y'all come, be sure to holler! I'd love to meet y'all! Will, that's a great question and I can't quite say. 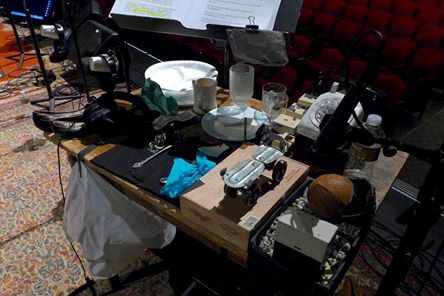 There's a full day's worth of rehearsal just before the show. Think 10am-5pm. Writing and test runs not included. Hello from Medford, WI. Does anybody know where Medford is? Hi Debbie! Hello Oregon Trail! Howdy Tim! Where is Medford?! Love Hilary Thavis... missing Heather Masse, though. Careful, Chak Man, I might take you up on that! North Central WI, Debbie. About 1 1/2 hours east of Eau Claire. GherkinCat, I might quote you on that! Hey Garrison - what do Lutherans have to look forward to? Hello hello! Watching from Arlington, VA, being the uprooted Sconnie that I am. 40's and 50's....time for shorts! after I press play nothing happens. Hello Paul! Tim, I'm afraid to ask. Is it something that should go to the joke machine? 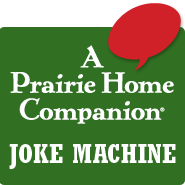 A Prairie Home CompanionA Prairie Home Companion's infamous Pretty Good Joke machine. Hello pahi, could you try refreshing the whole page and trying the video again? Hello Paul! Glad you could join us Cendra! Thanks for joining us tonight! 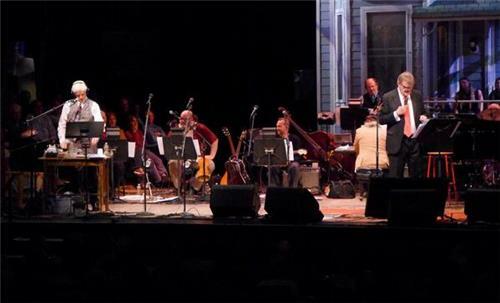 Some portions of tonight's show are not available for video streaming, but you can stream live audio of the full show using the listen link above the chat box. Enjoy the show! If you're experiencing technical difficulties with the video, please try refreshing this page. Some issues may be out of our hands but we'll fix anything we can!